One of the things I love about the sustainable building community is that it shuns dogmatism. We have innovators and leaders within our community who are eager to follow the line of best practices, wherever it may lead. There is very little axe grinding and a lot open conversation and co-learning. I like that and have greatly benefited from it. We recently completed a roof assembly that is very much the fruit of the rich conversation that buzzes about the sustainable building community. 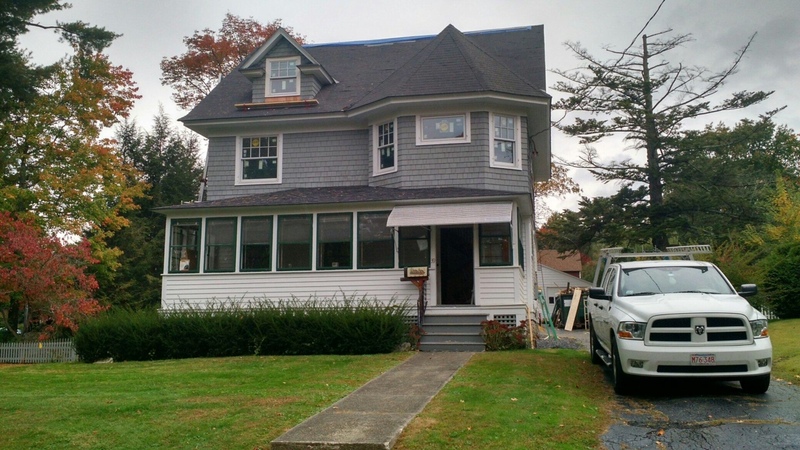 The assembly in question is part of a larger renovation project that we are doing for a couple in Great Barrington. One lesson I have taken away from developing this assembly is that there are few one-size-fits-all solutions to building design problems. The design we developed represents a very concrete solution to a very concrete set of problems. This is a set of problems we may well never see again, and therefore it yields a roof assembly we may never build again. But we learned a lot doing it, and that learning will inform every roof assembly we ever do again. The Great Barrington House. Plans call for converting the attic space into an open studio space. Comfort and energy savings were important considerations for the clients. Carpenters install the Mento membrane that will serve to separate the dense pack cellulose from the 1” vent space that will allow the cavities to be vented. Cavity-wide vent spaces help to manage the moisture dynamics that plague many well-insulated homes. They are also the best defense against ice dams. 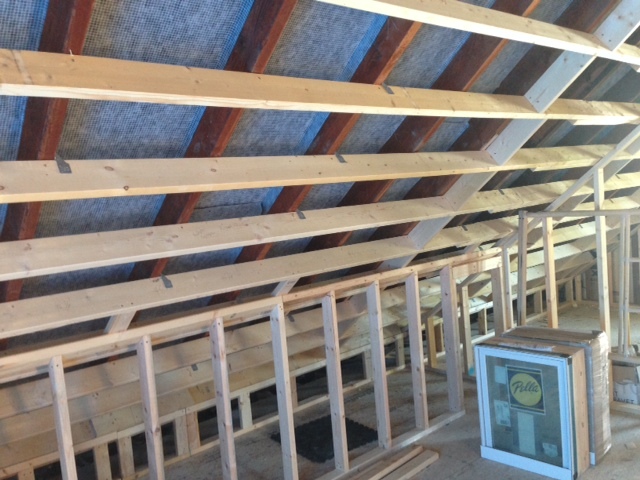 The existing roof rafters were far too narrow to hold sufficient amounts of insulation. 2×6 framing was run perpendicular to the rafters to deepen cavities. The perpendicular furring also greatly reduces thermal bridging. Energy modeling put the assembly R-value at 46, not super-insulated standards, but a vast improvement over the existing roof. The cellulose will be blown in behind a so-called smart membrane, whose variable permeability offers a primary line of defense against moisture issues. The vent plane is indicated by the blue line. Notice the cold air intake at the lower edge of the roof rather than in the soffits. Not only was this a more cost effective way of venting, but it also guarantees that air entering the vent space will be cold. Warm air under the roof deck is a key ingredient in the forming of ice dams. Cold underside of roofs means no ice dams.